One of the benefits of a TurboVote partnership is sponsored mailings. Scroll through this section to learn how users can receive mailings and what will be in the envelope! As a TurboVote partner, the cost of your partnership includes sponsored mailings for each person who signs up on your TurboVote site and elects to recieve their forms by mail. Want TurboVote to send you your forms? Choose I LIKE GETTING MAIL. These mailings are one of the best ways to knock down voting barriers for busy students, who now no longer have to find a printer, and an envelope, and a stamp but instead can get everything they need mailed right to their student mailbox. Below is a rundown of what's inside a TurboVote mailing. If a student needs a form(s) and has let TurboVote know that they like getting mail, TurboVote will generate a mailing and send it to their mailing address. 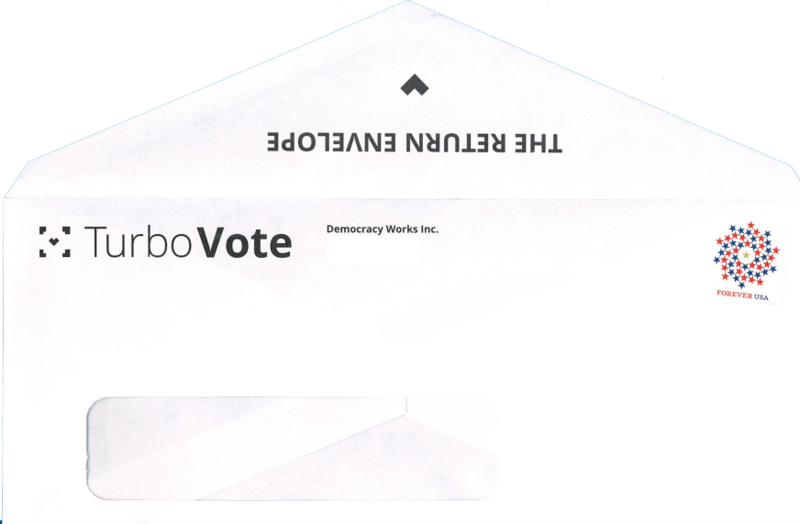 When the student opens their mailbox, they'll know the message is from TurboVote right away because of the bright blue color of the envelope. 1. an explainer of the items needed to fill out the forms. 2. the return address to which the student should send their forms. Did the student need to register to vote? TurboVote will include their pre-filled voter registration form in the mailing. TurboVote uses the National Voter Registration Form for all states which accept it. As noted in the instructions, the student only needs to complete three quick tasks to finish up their form. Write in their ID number, if required by the state. TurboVote does not ask for ID numbers for privacy reasons. Please note: TurboVote typically sends registration forms the day of or the day following a user’s signup. Meaning, the form should arrive in the mailbox in about 5-7 days. Did the student let TurboVote know that they will be voting by mail? TurboVote will include a state-specific absentee ballot request form in their mailing. Please note: TurboVote typically sends absentee ballot request forms about a month before an election. So, if a student has requested a voter registration form and an absentee ballot request form, these mailings may come separately. Finally, for every mailing, TurboVote includes a white return envelope with a stamp already pasted on it. You'll see that there is a clear window for the address, and that is because, when the student folds the instructions sheet, their election official's address will squarely fit into that box. Simply fold the forms, lick the envelope, and send!